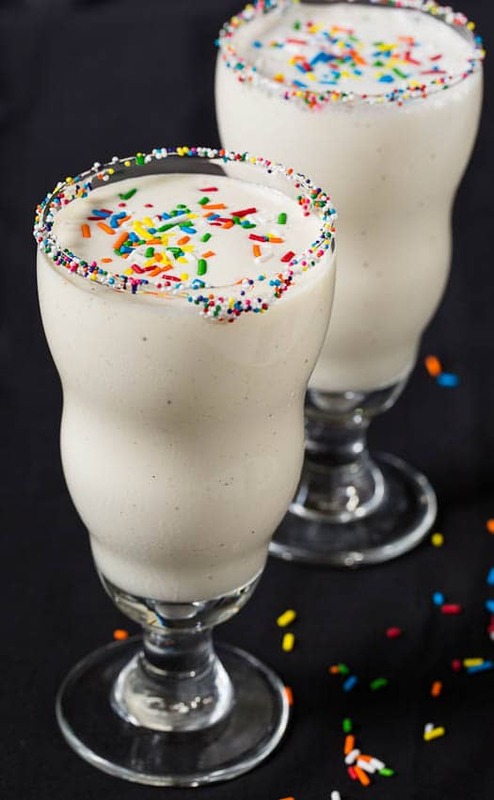 Creamy, thick, and sweet Cake Batter Milkshakes have all the flavor of that delicious cake batter you love to stick your finger in. And they only require a few ingredients and a couple minutes of your time. Cold Stone Creamery has completely ruined me when it comes to ice cream. Since trying their cake batter ice cream, it’s the only kind of ice cream I want. But Cold Stone is a good 20 minutes from my house and a little hard on the pocketbook, so I wanted to make a cake batter treat that we could enjoy at home. My daughter’s birthday last Friday seemed like the perfect occasion. We decided to skip a formal celebration with a cake since her schedule was so jammed pack with school starting back and her High School Swim Season in full gear. It only took a few minutes and we had drinkable birthday cake. These milkshakes are totally adaptable to your tastes. Go light or heavy on the cake mix depending on how much of that cake batter flavor you want. Add a few sprinkles or a lot. I like a lot! Add milk or half and half depending on how creamy you want it. A little liquid for a thick shake or extra for a thin shake that’s easily slurped through a straw. Any way you make it, it’s delicious. 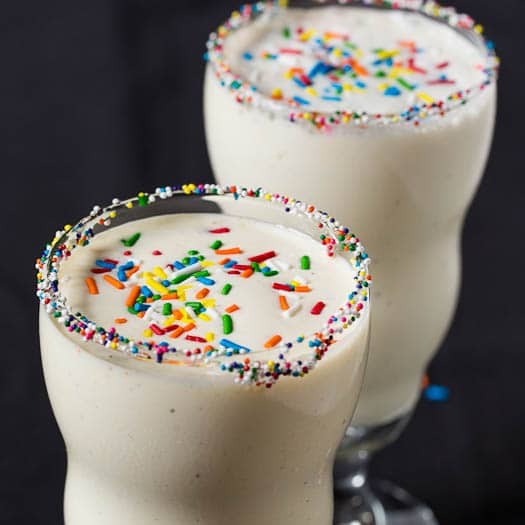 Creamy and thick milkshakes with an awesome cake batter flavor and lots of sprinkles. So easy and so fun! Add less milk for a thick shake and more for a more drinkable shake. Also Try Cake Batter Popcorn! This entry was posted in Desserts, Other Desserts and tagged cake batter, ice cream, milkshake. Bookmark the permalink. Look at you you glorious milkshake! … sorry I had to speak directly to the milkshake first. It’s just so pretty. 😉 And I know what you mean, Christin. How can you say no to cake batter once you’ve tried it?! 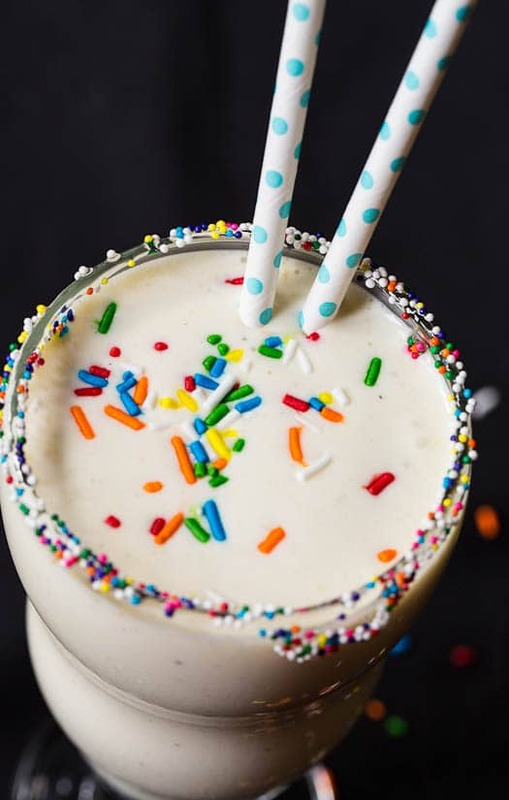 It’s ice cream with sprinkles and it doesn’t matter if it’s your birthday or not so all hail the cake batter ice cream (and this milkshake!). These look amazing, must try immediately! I’m so glad I found this post! These milkshakes are just unreal. I can’t stand how delish they look! 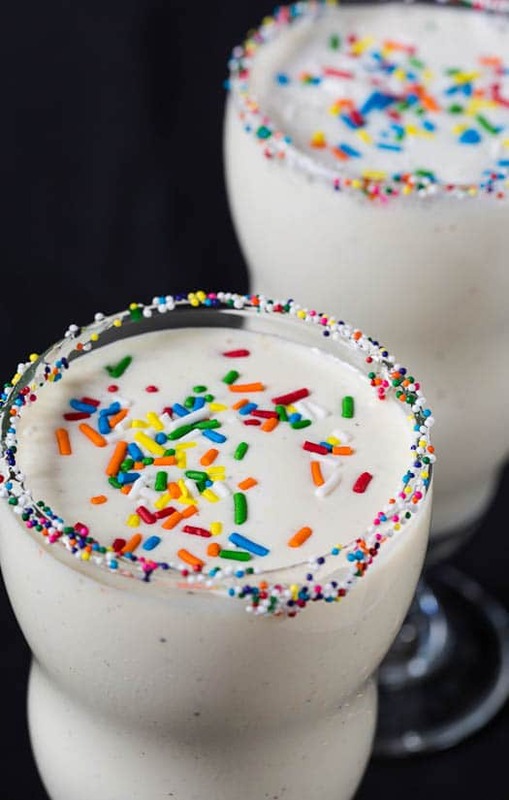 These milkshakes are so pretty and fun! I love that you made drinkable birthday cakes instead and the sprinkles are definitely super festive 🙂 Looks so refreshing and perfect for a summer celebration! Oh boy! This milkshake has my name written all over it! 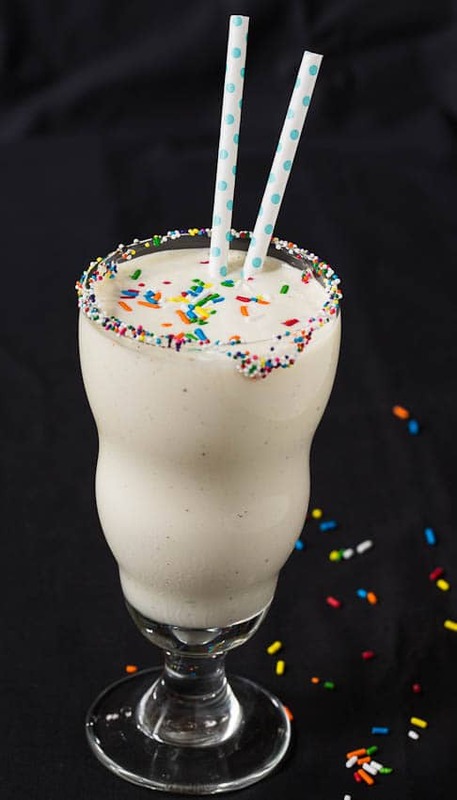 I would totally order this milkshake at a restaurant, sprinkles and all please! Oh man this looks awesome! Oh these are so fun! Sprinkles make anything festive! And milkshakes … man it’s been so long since I’ve had one!! This looks delicious! These milkshakes sound incredible! Wish I was sipping one right now! I’m not sure why, but recently I’ve been addicted to smoothies and shakes. When I saw this recipe, my head kind of exploded. I love the idea of using cake mix, that’s much more genius than my previous efforts(do not put butter in a milkshake. let’s leave it at that.). Definitely going to try this! Pinned. Happy belated birthday to your daughter! I saw these and had to smile. There is something about sprinkles that just makes life better! My son loves ‘birthday cake’ ice cream and even frozen yogurt. One day, I tried it and was amazed it was actually good (I did not grow up eating ‘birthday cake’ flavored ice cream!). This is really fun and a great birthday treat! Oh heaven – these look like a heavenly substitute for birthday cake! Cake batter milkshakes are my favorite, Christin! I made one a few months ago and it was so delicious! My recipe is slightly different than yours, so I will have to try this out! Looks delish! “Drinkable birthday cake”. Ha! Love that! I’m thinking I want this gorgeous milkshake instead of cake at MY next birthday. 😉 Looks so creamy and delicious, Christin! What a cute idea…cake in a glass!! Happy birthday to your daughter…and may she have a wonderful school year!